IF the vehicle has been subject to an unreasonable number of repair attempts at the authorized warrantor dealer for the same issue/complaint/system. This is anytime in the manufacturers bumper-to-bumper warranty, extended “powertrain” warranty, “hybrid warranty” or manufacturers CPO (Certified Pre-Owned) warranty (on used vehicles). IF the vehicle has spent more than 30 days in the authorized warrantors shop due to unavailability of warranty repair parts. IF the vehicle has spent a cumulative total of over 30 days in the shop (this is limited to 18 months/18,000 miles from original new vehicle delivery date) for various substantial issues. IF the vehicle repair history clearly indicates that the manufacturer (factory) is working on a “fix/update/software update/solution”, but does not yet have one available. IF warranty repair parts are on long-term backorder, with an estimated time exceeding 30 days from last repair attempt. IF the vehicle is in the authorized warrantors dealer, and the consumer is being informed by the dealership is waiting for the factory FSE (Field Service Engineer) to come out and offer assistance to the warrantors shop due to the warrantor shops inability to diagnose and/or effect repairs. IF the vehicle has seen multiple repair attempts with “no problem found”/ “operating as designed” / “operating same as another like vehicle”, etc., but the consumer can readily demonstrate the problem, and also capture it on video tape. IF the vehicle was sold “without” disclosure that it was a previous rental vehicle, frame/salvage damage title, or flood title. IF the vehicle has 2 or more factory warranty repair attempts (documented) wherein the customers complaint is something that if not corrected under warranty would likely result in serious injury or death. Did you end up with a lemon? 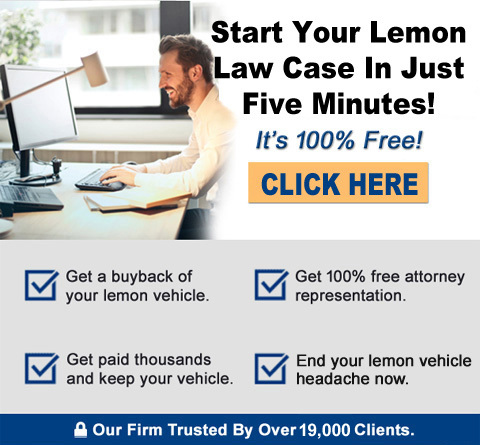 Talk to the Lemon Law Auto Expert – Free! The California lemon law is a state law that provides a remedy for purchasers and lessees of cars, trucks, and all motor-driven vehicles of less than 10,000 GVW in order to compensate for vehicles that repeatedly fail to get repaired by the authorized warrantor of the manufacturer for defects that “substantially impair the use, value or safety of the vehicle”. These vehicles are called “lemons”. The California lemon law (the Song-Beverly Consumer Act) protects purchasers and lessees in the State of California. 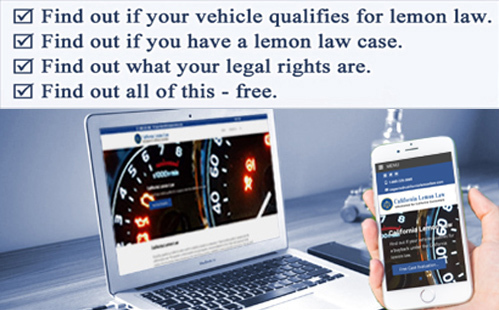 The California lemon law covers any vehicle covered by a warranty. The rights afforded to consumers by the California lemon law may exceed the warranties expressed in purchase contracts. At the core of the California lemon law is the manufacturer’s breach of warranty. A manufacturer’s warranty is what makes the manufacturer legally responsible for repairs to the consumer’s vehicle. It is a form of guarantee. An express warranty is typically a written warranty. An implied warranty unlike an express warranty, as it is not written. The law imposes these obligations on the manufacturer, seller or both. The California lemon law deals with written warranties, but can also be potentially utilized for “implied warranty of merchantability” as well. The California lemon law may cover situations like previous accidents, title “washing”, “salvage title”, and “odometer fraud/tampering” when the seller is aware of it and failed to disclose critical information to the buyer prior to/ at the time of purchase. A California lemon law claim is predicated upon the warrantor’s inability to effect warranty repairs for defects in workmanship and materials in a reasonable number of repair attempts. If a defect is likely to “result in serious injury or death” the number of documented repair attempts can be as little as two (2). Though there is no “typical” number of repair attempts needed for most general problems with vehicle, three (3) or (4) repair attempts is the recognized number in most cases. The California lemon law statute has a provision to protect consumers who have either too many days cumulative in the shop, too many days at one stretch (30+ continuous) for repairs, or for lack of availability of warranty repair parts for 30+ days continuous. A recent State of California Appellate Court decision further clarified what a consumer’s responsibilities are in regards to warranty repair documentation requirements. To create a “repair attempt” under the California lemon law statute, a consumer must deliver the vehicle to the dealer, have a repair order created with the vehicle owners complaints/symptoms clearly noted, and for the vehicle owner to give the warranty providing dealer the opportunity to diagnose, and effect repairs to the vehicle to correct the non-conformity to warranty. The California lemon law deals with breach of warranty. Automobile dealerships often offer for sale what they represent as “extended warranties”. These are in actuality, under our California lemon law statute, a “service contract”. The distinction between a “warranty” and a “service contract” in California is that a “warranty” is provided at no cost to the consumer, a “service contract” is a mechanical breakdown insurance policy that is sold to the consumer. Repairs performed under any non-warranty “service contract” are not applicable as “repair attempts” under the California lemon law. Prior to 2011, vehicles which were no longer in the possession of the owner/lessee at the time a California lemon law claim was filed were not applicable. Recent legislation saw a dramatic change in the California lemon law wherein if a consumer had repeated warranty repairs while in possession of the vehicle, but now no longer owns the vehicle, the consumer can still have rights under the California lemon law. Consumers in California have various potential remedies under the California lemon law. One is known as a “repurchase”. This is where the automobile manufacturer buys the vehicle back, and returns all monies paid to the consumer. The automobile manufacturer also pays off any lease or loan balance. A statutory usage charge is calculated according to the state statute instructions. The consumer turns the vehicle back into the manufacturer’s transfer agent, and the “repurchase” (buyback) is completed. The second remedy under the California lemon law is the “vehicle replacement”, which is commonly a “substitution of collateral” when a loan/lease is in place. In California, both the automobile manufacturer and the consumer must be in mutual agreement for a vehicle replacement to take place. There is no duty under the statute for either party to accept this resolution if one party does not agree with it. “Vehicle replacement” is only applicable to vehicles that were purchased or leased new. The California lemon law is a law that nearly always requires “legal force” to enforce it. This means an attorney to represent the consumer in their lemon law claim/case. California is a “fee shifting” state. This means that the consumer does not pay the attorney for the time and costs spent when the attorney pursues legal process with the automobile manufacturer. Quite often the manufacturer’s insistence that the vehicle does not qualify in their opinion forces the lemon law attorney to file a complaint (lawsuit). This is an important fact in lemon law cases. Wherein a individual consumer can produce little or no pressure on a automobile manufacturer to settle, a lemon law attorney can, if need be – take a case all the way to court for resolution. A consumer simply does not have the legal clout that a lawsuit yields when pursued by an attorney. Arbitration is an alternate dispute resolution mechanism that was lobbied-for by automobile manufacturers. It is not “impartial”, as it is paid/funded wholly by the automobile manufacturers. There is no requirement for a California consumer to apply, nor utilize arbitration before utilizing a lemon law attorney for legal representation. There are 3 potential resolutions to a arbitration hearing on a California lemon law case. 1. Win. 2. Lose. 3. “Repair Decision”. This is where the arbitrator, prompted by the automobile manufacturer’s representative, orders an additional attempt at repairing the issue at question. The California lemon law bases itself upon the presumption (and requirement) that a written warranty be in place, and that the “repair attempts” done are while the vehicle is under such warranty. Automobile manufacturers have various limited warranties. New vehicles have “bumper-to-bumper” warranties, as well as longer-term “powertrain” warranties (covers the engine/transmission/final drive). Some automobile manufacturers have “diesel engine warranties” that may extend to 100,000 miles. On used vehicles, there is another type of warranty from the automobile manufacturer. These are known as “Certified Pre-Owned” or “CPO”. The automobile manufacturer gives the used vehicle warranty coverage backed by the factory, just like a new car.